Brentford's most successful period came during the 1930s, when it achieved three consecutive top-six finishes in the top flight. The club have been Football League Trophy finalists on three occasions. Their main rivals are fellow West London clubs Fulham and Queens Park Rangers. League positions of Brentford since the 1920–21 season of the Football League. 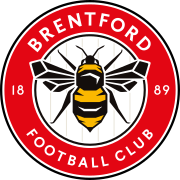 Brentford's nickname is "The Bees". The nickname was unintentionally created by students of Borough Polytechnic, who attended a match and shouted the college's chant "buck up Bs", in support of their friend and then-Brentford player Joe Gettins. Brentford's predominant home colours are a red and white striped shirt, black shorts and red or black socks. These have been the club's predominant home colours since the 1925–26 season, bar one season – 1960–61 – when yellow (gold) and blue were used, unsuccessfully. The colours on entering the Football League, in 1920–21, were white shirts, navy shorts and navy socks. Away kits have varied over the years, with the current colours being a predominantly brown shirt with orange shoulders and white trim, brown shorts and socks with orange and white trim. Brentford have had several badges on their shirts since it was formed in 1889. The first one, in 1893, was a white shield, with 'BFC' in blue and a wavy line in blue, which is thought to represent the river and the rowing club, who founded the football club. The next known badge, the Middlesex County Arms, was on shirts donated by a club supporter in 1909. The Brentford and Chiswick arms, as a badge, was used just for the one season, in 1938–39. The next badge wasn't until 1971–72 when a shield, formed into quadrants, which had a hive and bees in one, 3 seaxes in another and the other two with red and white stripes. In 1972, the club organised a competition to design a new crest, which was won by Mr BG Spencer's design, a circle with a bee and stripes with founded 1888. This was introduced in 1973 and used until May 1975, when it was brought to the clubs attention, via Graham Haynes, that the club was formed in 1889 and not in 1888. Therefore, a new badge, reputedly designed by Dan Tana – the clubs chairman at the time – was introduced for the 1975–76 season and continued until 1994 when the current badge was introduced. In 2011 Russell Grant claimed to have designed the badge in a BBC interview, however it was in fact designed in 1993 for two season tickets by supporter Andrew Henning, following a request from Keith Loring the then chief executive. In 2017, the club redesigned its crest to a more modern, uncluttered, design with the flexibility for use in two tone colour print. The design is a double roundel with the club name and year founded in white on a red background and a large central bee. Brentford's main rivals are Fulham and Queens Park Rangers. Brentford have a long-standing rivalry with Fulham. In the past this fixture has been marred by crowd violence. Brentford's rivalry with Queens Park Rangers intensified in 1967, when Rangers failed in an attempted takeover of Brentford, a move which, had it succeeded, would have seen Rangers move into Griffin Park and Brentford quit the Football League. As with the Fulham rivalry, this fixture sees passions run high amongst both sets of supporters with local pride at stake. In February 2013 it was announced that Brentford had entered into partnership with Icelandic 1. deild karla club UMF Selfoss, enabling Brentford to send youth and development squad players to Iceland to gain experience. The partnership also sees the two clubs exchanging coaching philosophies and allows Brentford to utilise UMF Selfoss' scouting network. In May 2013, the Brentford staff forged links with Ugandan lower league club Gulu United as part of the "United for United" project, aimed at forming the region's first youth training camp and identifying talented players. Brentford owner Matthew Benham became majority shareholder in Danish club FC Midtjylland in 2014 and the staff of both clubs share ideas. Actor and comedian, Bradley Walsh was a professional at the club in the late 1970s, but never made the first team squad. ^ "EFL Official Website – Brentford". EFL. Retrieved 3 January 2019. ^ "Robert Rowan: Brentford plan tributes to former technical director". BBC Sport. 22 November 2018. Retrieved 23 November 2018. ^ "Brentford FC Football Staff". www.brentfordfc.com. Retrieved 8 November 2017. ^ "Brentford FC Company Details". www.brentfordfc.com. Retrieved 8 November 2017. ^ KD. "Ken Daly's alternative look at the history of Middlesbrough and Brentford who play in a Sky Bet Championship play off at Griffin Park on Friday 8 May 2015". www.mfc.co.uk. Retrieved 3 August 2015. ^ a b Haynes 1998, p. 30-31. ^ a b "Brentford – Historical Football Kits". Historicalkits.co.uk. Retrieved 5 May 2016. ^ a b c d e f g h "Introducing our new club crest". Brentford FC. 10 November 2016. Retrieved 6 October 2018. ^ "Which Strictly star designed Brentford's badge?". BBC News. 12 November 2011. ^ a b c d e f g h i j "Football Club History Database – Brentford". www.fchd.info. Retrieved 12 February 2018. ^ a b "London League 1896–1910". nonleaguematters.co.uk. Retrieved 14 May 2018. ^ a b Haynes, Graham (1998). A-Z Of Bees: Brentford Encyclopedia. Yore Publications. pp. 135–136. ISBN 1 874427 57 7. ^ Haynes 1998, p. 96. ^ a b White 1989, p. 354. ^ a b Haynes 1998, p. 119-120. ^ White, Eric, ed. (1989). 100 Years Of Brentford. Brentford FC. p. 97. ISBN 0951526200. ^ a b White 1989, p. 82-84. ^ "England 1918/19". Rsssf.com. 15 February 2003. Retrieved 4 May 2016. ^ Haynes 1998, p. 46. ^ Haynes 1998, p. 51. ^ a b c "Brentford FC CST: Awards". www.brentfordfccst.com. Retrieved 1 May 2016. ^ Chapman, Mark. "Brentford win 2015 Football League Family Excellence Award". brentfordfc.co.uk. Retrieved 14 May 2015. ^ FC, Brentford. "Brentford achieves the Football League Family Excellence Award". www.brentfordfc.co.uk. Retrieved 6 May 2016. ^ Chris Wickham. "A list of all the awards collected by Brentford FC, staff and players over the past year". brentfordfc.co.uk. Retrieved 3 December 2014. ^ Brentford Matchday Magazine versus Brighton & Hove Albion 22/08/98. Charlton, London: Morganprint. 1999. p. 3. ^ "League Managers Association". leaguemanagers.com. Archived from the original on 8 December 2014. Retrieved 15 October 2015. ^ "Brentford FC Moment in Time: Norwich City". Archived from the original on 23 December 2017. Retrieved 22 December 2017. ^ "THE RESULTS OF THE LARGEST EVER SURVEY INTO CLUB RIVALRIES" (PDF). Footballfancensus.com. Archived from the original (PDF) on 20 October 2013. Retrieved 5 May 2016. ^ "Football Ground Guide". Football Ground Guide. Retrieved 4 May 2016. ^ "Fulham F.C. – The 1995/1996 Season". Web.archive.org. Archived from the original on 23 August 2002. Retrieved 4 May 2016. ^ Haynes 1998, p. 123-125. ^ "Brentford FC vs. QPR". Footballderbies.com. 6 October 2006. Retrieved 4 May 2016. ^ Chris Wickham. "Brentford club staff visit FC Midtjylland". brentfordfc.co.uk. Retrieved 3 December 2014. ^ "BBC Sport – FC Midtjylland: Brentford owner Benham invests in Danish club". BBC Sport. Retrieved 3 December 2014. ^ Wickham, Chris. "BEES AGREE ICELANDIC PARTNERSHIP". brentfordfc.co.uk. Retrieved 3 December 2014. ^ Wickham, Chris. "JOIN BRENTFORD IN SUPPORTING GULU UNITED". brentfordfc.co.uk. Retrieved 3 December 2014. ^ Brett, Ciaran. "STUART 'AMAZED' BY GULU EXPERIENCE". brentfordfc.co.uk. Retrieved 3 December 2014. ^ "United for United: Supporters of The Biggest Little Football Club in the World – Indiegogo". Indiegogo. Retrieved 3 December 2014. ^ "Brentford | News | Latest News | Latest News | EX BEES ROVER RETURNS". brentfordfc.co.uk. 16 August 2006. Archived from the original on 7 October 2018. Retrieved 12 February 2018.